To the South lies Derbyshire with its spectacular Dales and to the North Skipton and the Yorkshire Dales. The historic city of York is about 50 miles away and around an hour’s drive. Nearer to home, the towns of Halifax, with the wonderful and newly renovated Piece Hall, and Huddersfield with its Premier league football team, are only about six miles away. Leeds and Manchester are 25 and 30 miles away respectively or also can be visited by train from Sowerby Bridge railway station. For shopping, The Trafford Centre is a 50 minute drive. Blackpool and St Anne’s on the West Coast are 75 miles away on an easy motorway route taking 75 minutes on a clear run. 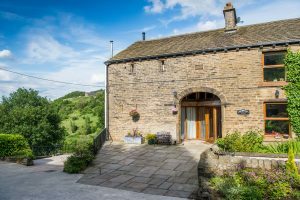 Besides its dramatic moorland and valley scenery, crossed by numerous footpaths, and traditional stone buildings, there is a wealth of exploring to do in town, village and country. Walks and cycle routes are straight from the door of the barn and on Marsden Moor National Trust area 5 minutes drive away, birdwatchers can find curlews, twites, lapwings and golden plover. Deer and spotted woodpeckers are seen from the barn itself. To the North, just 10 minutes drive away, Ripponden hosts the annual Pork Pie festival at the oldest inn in Yorkshire (the Old Bridge Inn) on the last weekend of April. The first weekend of September sees the local Rushbearing festival and the nearby Norland scarecrow festival. Ripponden is also a village with lots of great pubs and restaurants. The Fleece was recently voted Yorkshire’s best pub and its views of the Ryburn Valley are magnificent in the spring and summer. Although rural, we also have no less than 3 well stocked farm shops within 10 minutes drive of us, one which even opens 7 days so you can get all your necessary provisions. To the South into Kirklees, also just 10 minutes drive away, is the small town of Slaithwaite (pronounced Sla’wit) with artisan bakery and plenty of cafes and pubs. We are also just 2 miles from the Marsden Moor National Trust park. Recently our area was heavily featured in the series “Last Tango in Halifax”. Just 15 minutes drive away is the town of Marsden, the base for TV programme “Where the Heart is” . This also has nearby Standedge Canal Tunnel, the longest, highest canal tunnel in the country which has a local visitor centre with indoor children’s play area. Here you can learn how to “leg”it all the way to Lancashire. Just a few miles further on, and you will reach Holmfirth, famous as the filming place for “Last of the Summer Wine” and a little further on the Holme Moss road – well known in the local cycling fraternity. Around 5 miles away, in Linthwaite, Titanic Spa offers the latest in pampering and spa days. Local towns of Halifax and Huddersfield are around 7 miles away and are endowed with many historic buildings and have some great parks including Shibden Park and Greenhead Park (also with tennis courts & bowling). Halifax has landmarks of the Piece Hall (fabulously renovated and reopened in 2017 with plenty of events on) and Shibden Hall which is now a folk museum. EUREKA! museum for children is proving to be a top national attraction. It is a unique, hands-on museum greatly enjoyed by visitors. Hebden Bridge is an attractive small town around 25 minutes drive built into steep valley sides, offering narrow boat rides along the Rochdale Canal; it has a wealth of independent shops, bars and restaurants. Mytholmroyd, just next door was the birthplace of Ted Hughes.